A feasibility study conducted recently by India and Australia has indicated that a Free Trade Agreement (FTA) would be in the interest of both the countries. In view of these recent developments, this article analyses the trade between the countries using a novel framework based on Revealed Comparative Advantage (RCA). The article concludes that FTA could possibly initially increase the trade imbalance in Australia�s favour, but in the long term it would be beneficial to India not only to increase trade but also in gaining expertise in few key sectors and access to hitherto less explored eastern markets. As a step to further develop the growing ties, Australia and India decided in 2007 to undertake a feasibility study to ascertain the potential of a possible bilateral FTA. The feasibility study recommended that the two countries go ahead with a comprehensive bilateral FTA.2 In this context it is important to identify the specific categories which have a potential to enhance the trade relationship and also understand the trade barriers that are affecting the trade between the countries. The structure of the Indian economy has undergone a significant change in last two decades with services contributing more than 50% of the GDP.3 The Indian growth story has been led by the services sector unlike most other economies which have followed a manufacturing led development. Consequently India�s exports have primarily been dominated by raw materials and other labour intensive categories such as mineral fuels and precious stones. Australian economy, similar to most other advanced economies, has been dominated by the services sector which contributes around 70% to the GDP. However, mining industry still remains a significant contributor to the country�s economy. India�s demand for raw materials and intermediate goods has contributed significantly to this growth in bilateral trade. Indian imports from Australia grew by a CAGR of over 32% during the period 2001-09 while the export to Australia grew at a rate of only 17%. This has resulted in a huge trade deficit for India vis-�-vis Australia. 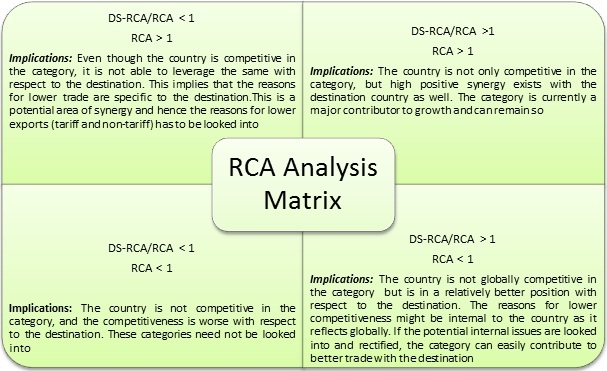 We have analysed the bilateral trade between India and Australia using a novel framework based on a well-known trade statistic known as Revealed Comparative Advantage (RCA) developed by Bela Balassa.6 We have used the framework to identify export categories for India and Australia which deserve attention. RCA helps in identifying whether a country has relative export advantage or disadvantage with respect to the rest of the world in a particular category of goods or services. We have developed a slightly tweaked version of RCA called Destination-Specific RCA (DS-RCA) for the purpose of our study. This measure helps in identifying trade competitiveness vis-�-vis the world, for a particular export destination. It is measured by considering the export destination as the market instead of the whole world. We have used Harmonised System (HS) at level 2 disaggregation for the goods trade categories. After computing RCA and DS-RCA for various trade categories, we have found out the ratio, DS-RCA:RCA. Based on whether the ratio is greater than 1 and whether RCA is greater than 1, we have come up with the analysis framework as shown in Exhibit 2. As can be seen from the exhibit, the categories which deserve attention are those which fall in the top left quadrant of the matrix. These are the categories where the gap will be primarily due to either lack of focus or country-specific tariff or non-tariff issues which can be rectified through an FTA. Based on the above analysis, we identified the relevant product categories which are listed in Exhibit 3. Even though India�s top exports are highly complementary with Australia�s top imports, relatively low competitiveness in these categories in Australia is contributing to trade imbalance for India. However, many Indian export categories are showing steady growth in RCA over the years analysed (2001-2009) not only globally but also with respect to Australia. Many of Australia�s top exports do not feature in India�s top imports. 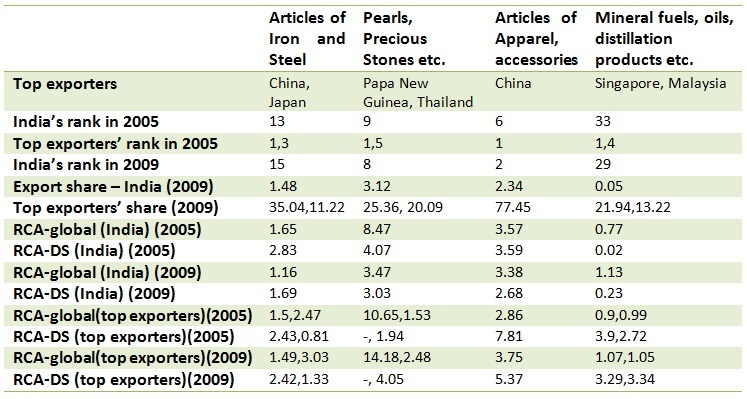 However, there are key categories like mineral fuels, pearls, precious stones and metals where Australia is highly competitive. As these categories are highly relevant globally, Australia is having high export volumes to India as well. However, for many of Australia�s top exports, the RCA specific to India is growing slowly compared to the global RCA. In this section, we explore the competition for India in the export categories identified. We have done comparisons with the top two importers to Australia for the relevant categories. The results are as shown in Exhibit 4. Thus, in all the categories identified and specifically in apparel trade, a lack of focus can be one of the contributing factors to low trade competitiveness. An FTA can indirectly help India in this regard by diverting the attention of exporters towards the hitherto ignored geographically distant eastern markets. In this section, we look at the barriers in expanding the trade volumes between India and Australia. We would also look at the role FTA can play in resolving the same. The trade barriers can be broadly classified into tariff-based and non-tariff based. Australia already employs one of the lowest import tariffs globally which stood at an average of 3.1 percentage in 2010.8 Moreover, they have employed unilateral tariff cuts on many product categories. In case of three of the four categories identified for Indian exports, the tariffs faced by India are at par with that of top competitors. The only exception is that of pearls, precious stones etc. where the key competitor Thailand enjoys an FTA with Australia. Thus, contrary to popular beliefs, an FTA may not do much good for India�s exports to Australia. However, the fact that Australia employs comprehensive tariff cuts is encouraging for India. This is well illustrated by the case of Australia-Thailand FTA where tariffs were eliminated on 96% of imports. At the same time, Australia can gain a lot from FTA as India currently employs relatively high tariff levels. Indian imports have high bound rates close to 50% which creates high uncertainty for importers.9 Thus, all in all, FTA may worsen the trade imbalance for India from a tariff standpoint. The trade barrier reporter database of UNCTAD identifies 25 non-tariff barriers faced by India from Australia of which 32% falls under Sanitary and Phyto-Sanitary (SPS) issues. These issues adversely affect agricultural produce, machinery and most importantly textile exports from India. On closer examination, most of the barriers arise due to mismatches in standards and also due to trivial issues like labelling requirements. India also employs multiple SPS measures on Australia. A noteworthy case is that of dairy products where Australia is highly competitive and is keen to enter the Indian market. While India imports dairy products from European countries like Italy and Switzerland, it imposes quarantine restrictions on Australia.10 It is viewed that these restrictions are in place to counter the strict SPS norms Australia themselves follow. Thus, an FTA can play a major role in reducing the non-tariff barriers by introducing Mutual Recognition Agreements (MRA) and thereby eliminating the issues due to mismatches in standards. This can increase Indian textile exports to Australia and Australian agricultural exports to India. As both countries are globally competitive in the respective categories, a MRA can do a world of good. Our study shows that an FTA with Australia might worsen the trade imbalance if the focus is only on quantifiable steps like tariff reduction. A much more comprehensive treaty which covers issues like standards mismatch etc. especially through Mutual Recognition Agreements and so on would help India beef up its exports and also benefit from Australian imports. This article has not touched upon services trade and investment activities. If these are also looked into, the FTA could certainly help India not just from a trade imbalance point of view but also from a strategic point of view of access to the east. Rupa Chanda is a Professor in the Economics & Social Sciences Area at IIM Bangalore. She holds a PhD in Economics from Columbia University with specialisation in International Trade and Macroeconomics. She can be reached at rupa@iimb.ernet.in. Nazeer Ahamed Kutty (PGP 2010-12) holds a Bachelor�s degree in Mechanical Engineering from National Institute of Technology Karnataka, Surathkal and can be reached at nazeer.kutty10@iimb.ernet.in.